Musiblocks: make controlling your tunes child's play. If you're bored of using buttons to control the playback and volume of your music, you'll be wanting to take a look at the Musiblocks. The beating heart of a set of these is the control block. This actually plays your music and responds to the movements of the other blocks (these are simply wooden cubes containing tin conductors). As blocks are stacked, the volume increases; turn a block and the music skips to the next track. 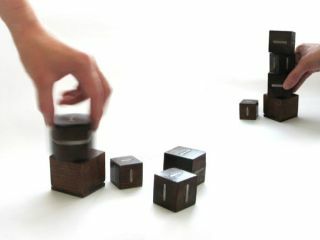 The video below probably explains things better - the Musiblocks almost seem like a lower-tech, music listeners' version of Percussa's Audio Cubes. They're not in production at the moment, but if the demand for them is there, presumably there's a possibility that they could be in the future.